Robert Edgar Coole, then known as Edgar but in later life Joe, was the youngest son of William Coole, who farmed Denfurlong, and Lydia Harriet née Camm. Born on 27 April 1900, his childhood was barely over when war was declared. Not long afterwards the farm were supplying hay for horses abroad; Edgar's name was on the label of some hay seen by his relative, Richard William Rowles, whilst serving in France. 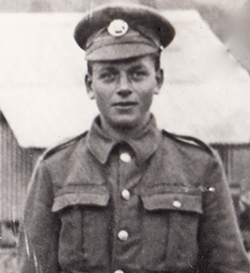 Initially too young for conscription when it was introduced (unlike his older brother, Frederick), Edgar's family believe that his service was in Ireland (see also the photograph in our Gallery). Although the British Government had promised Home Rule for Ireland in September 1914 and very many Irish volunteered to serve in the British Army, there was continuing trouble from protests and strikes which culminated in the Easter Rising of 24-29 April 1916 in Dublin. About 16,000 British soldiers were stationed in Ireland during the First World War to maintain the peace, in addition to naval bases and other establishments which were purely concerned with the prosecution of the war against the Central Powers. Edgar's role is not known, but his war service is commemorated on the plaque in the village hall. Edgar married Florence Kemp in 1929, bringing up their children, Peggy, Leslie and Joan, at Denfurlong, which the family still farm today. Robert Edgar Coole was buried on 29 January 1983 at St Mary's churchyard in Frampton.